Hello. I "learned" recently from a gent who emailed me that "the revolver was obsolete" and no longer a viable defense option and that I should not be suggesting otherwise on my site! Just for grins, today I took a used Model 10-6 HB that I purchased a while back to the range and timed some practical-type drills. I am not suggesting that how much these are or are not relevant to effective defensive shooting, only that this is what I did. This is the revolver that was used. It is DAO and all shots were fired double-action. The stocks are from Eagle and are their Secret Service style. Ammunition used was handloaded and represents (to me, at least) a round comparable in recoil to Remington's 158-gr. LSWCHP +P. 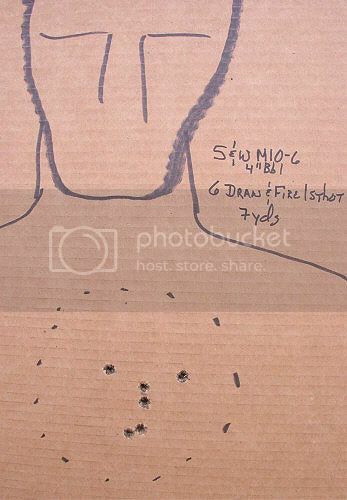 It averaged just under 900 ft/sec from this revolver based on a 10-shot string over the chronograph screens which was the usual 10' from the muzzle. Drills from the low-ready as well as presentation from the holster were done and were timed with a PACT timer, darned ol' merciless thing! All shooting was done two-hand hold and standing at varying distances, none farther than 12 yards. This group was fired starting from the draw with "hands up" in the traditional "IPSC Surrender Position". As can be seen, it was repeated 6 times. Average time was 1.40 sec per shot including reaction time when the buzzer sounded. Other drills included the traditional "Mozambique", Mr. Higginbotham's "Handgun Controllability Drill" as well as drawing and firing one "rescue shot" at about 4 yards. Today's exercises were not intended as any sort of training regimine but I do think that they are "doable" by most shooters and can provide at least an idea as to how viable a medium-power, medium-frame revolver is or is not for them. Great Post Mr. Camp. Thanks for the pictures and the range report. I am not for sure who made this quote, but I like it - "There are two types of people who will use a revolver (as opposed to a semi-auto Pistol): a novice who doesn't know the difference...and a master who does. " Very interesting. I recently did some training for a guy who needed several different Texas licenses. This guy has worked for Steel Corp in Iraq, is former Marine and worked a high profile Washington VIP protection gig. The Texas courses were a breeze for him. Since it had been a while since he shot, he asked me to run him through one of his old "high speed" qualifications. It was a difficult course requiring very fast shots from the holster. As is common, he wanted to see the instructor shoot. In bad form, I only had my S&W model 10 with me in my range bag, so I shot it from a universal holster I never use. I aced his course. I say that not to brag about my shooting, but as a testament to the good ol' revolver. I would never feel under-gunned with a revolver as opposed to a semi-auto. 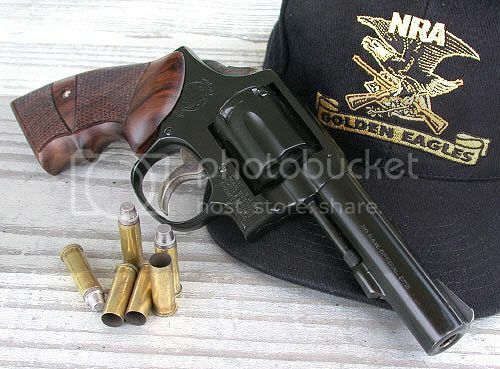 I really want to find a good S&W .41.
txinvestigator wrote: I really want to find a good S&W .41. A Model 58 like Win Bear? Nice revolver,am i correct to assume the model 10 was a version of the model 15 combat masterpiece only the model 10 had fixed sights.When i was in the USAF Security Police in the late 70's we carried S&W model 15 revolvers.